I am so looking forward to the second installment of The Hobbit movie this Christmas. Anyone else? If I didn’t have two young children who insist on getting up at 7am (I know, I’m spoiled, some children get up MUCH earlier) I would so be going to a midnight showing. I guess my midnight showing days are over… at least until my kids are old enough to be interested in that sort of thing. This post is not even really a review, either, but rather just some musings about another one of my all-time favorite books and the role it has played in who I am today. I don’t even remember how old I was the first time my dad read me this book. Probably pretty young. He read us that book many times before I ever even knew there was more to the story. He read us Lord of the Rings when I was maybe ten or eleven. I still remember meeting Aragorn for the first time, experiencing Helm’s Deep for the first time, watching Eowyn slay the Nazgul, and laughing out loud in true delight when she points out the loophole in the Nazgul’s prophetic armor. I owe much of my love of fantasy to J.R.R. Tolkien. The Hobbit was the first true fantasy I was ever introduced to, and I never looked back. I haven’t branched out a ton in my interests – though I love things like “Little House on the Prairie” and anything Shakespeare ever wrote… but the vast majority of my library is comprised of fantasy books. And that, my friends, is how you know it’s a truly good book. 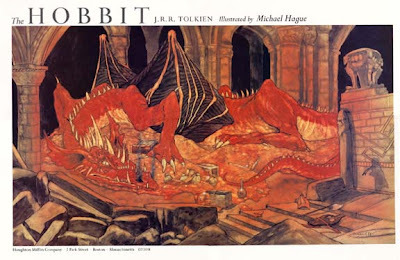 I’ll just leave you with this picture from my favorite edition of “The Hobbit.” This illustration is from the 1984 green hard-cover edition of the book, and the illustration is by one Michael Hague and I just love his illustrations. I desperately want to own my own copy of this particular edition, but it is extremely hard to find. Anyway, this is the best illustration depiction (in my humble opinion) of Smaug. I’m really hoping the movie gets him right. One of my all time favorites as well. I read it first in high school and it was certainly the first fantasy book I had ever read. My tastes in literature lean more towards the classics when it comes to reading but to me, this is right up there with the best of them. I too am hoping they get Smaug right. I can’t think of a movie that has ever gotten dragons right, actually. But if anyone can and should, it will be Mr. Jackson and his talented team. Have you seen “Reign of Fire”? It’s not talking, fantasy dragons… but WOW did they get the look and feel of dragons right!!! I also think that the dragon in the BBC show “Merlin” is done quite well. Yes I did see “Reign of Fire”. It was an odd movie that I thought fell flat when I watched it. You’re right, though, I suppose they did get the look right. I had forgotten about that movie. The dragons failed to work for me in that film, though, because at some point I ceased to really think of them as dragons. The way they were presented, they came across more like flying dinosaurs that breathed fire. They were more like *beasts* than dragons if that makes any sense. I didn’t feel they really captured the essence of the dragon that I get from reading stories like “Beowulf” or “Children of Hurin” by Tolkien. A dragon is a force of nature, something primal, almost like an earthquake or a volcanic eruption personified and with intelligence. When you explain them away with scientific jargon they really loose that “dragonish” quality to them. The way a dragon is presented in a movie or story has as much to do with personality and atmosphere as anything. Which is why I have such high hopes for “The Hobbit”. Smaug is so “dragonish” in character that if they just get the look right, they will have it. Perhaps my standards are just too high. I have not seen Merlin, though. I’ll try to see if I can find a clip on youtube. Merlin is available on Netflix as well, if you have watch-it-now. It’s a little cheesy and has that BBC “lower budget” look… but I really love it. Yeah, they weren’t fantasy dragons in Reign of Fire, definitely, but if they could take the look and graphics of those dragons and pair them with the cunning/cleverness of Smaug, they might just about have it right. I think what I loved about Reign of Fire most was that there was nothing “lumbering” or “silly” about the dragons. I’m glad you loved those Bedtime Story Times. I remember all (5) of us with our heads on (1) Pillow, and reading aloud to you kids. Certainly a point in every single day that I looked forward to. I may have introduced you to the Hobbit………but you introduced us to so many more characters and books than I can ever claim credit for……..Taran of Caer Dalben……..Count Olaf………..Hank the Cowdog………….Kiernan Kane, Brant, and all the rest in Tellurae Aquaous…………and soon a whole new world and cast of characters………………I can hardly wait. Some of my all-time favorite moments of my life were of family-reading-together-before-bed evenings. Derek and I talked about Grayden’s World all the way home from Nashville (with a few breaks to listen to our new favorite CD) and I am really excited about what is going to happen in that series. That’s so cool that you read Tolkien to your kids! My dad didn’t actually read it to me, but some of my earliest memories are of him sitting in my room with his back against the door frame and telling us the LOTR stories. He’d read them so many times he knew them by heart. I went to sleep with stories of Frodo and the Ring. My mom DID read me the Chronicles of Narnia, though. Both went far to give me a healthy love of high fantasy. Great post! So much fun!